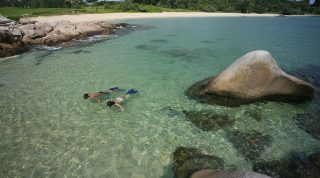 Right on Singapore’s doorstep, the Indonesian island of Bintan is often thought of as little more than a quiet beach getaway. But the place is more beguiling than you think, with a rich tapestry of traditional communities, natural highlights, and some mouth-watering seafood to feast on. And thanks to new lodgings in both the north and south, there’s even more reason to linger. 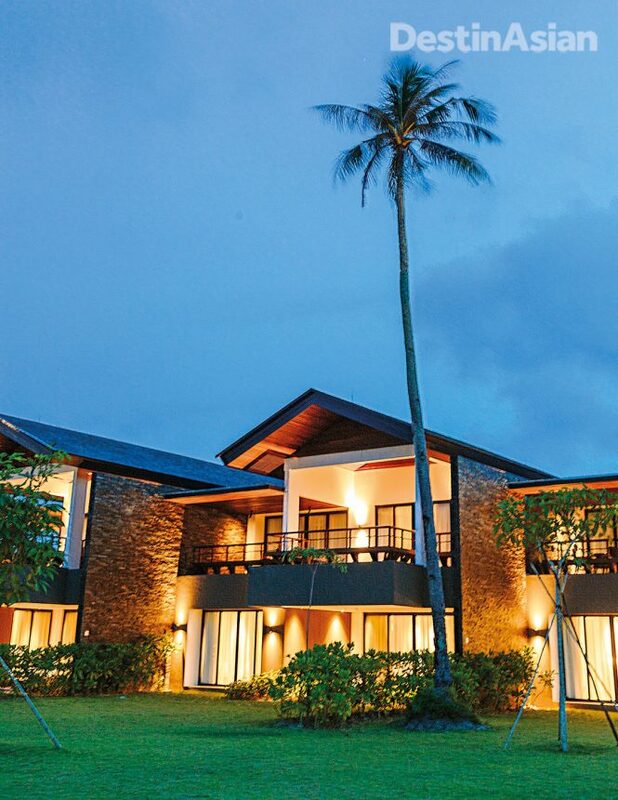 Villas overlooking the South China Sea at The Residence Bintan, the island’s newest resort. Racing across the scrubby interior of Bintan in a beat-up taxi, I almost feel like a fugitive on the run. 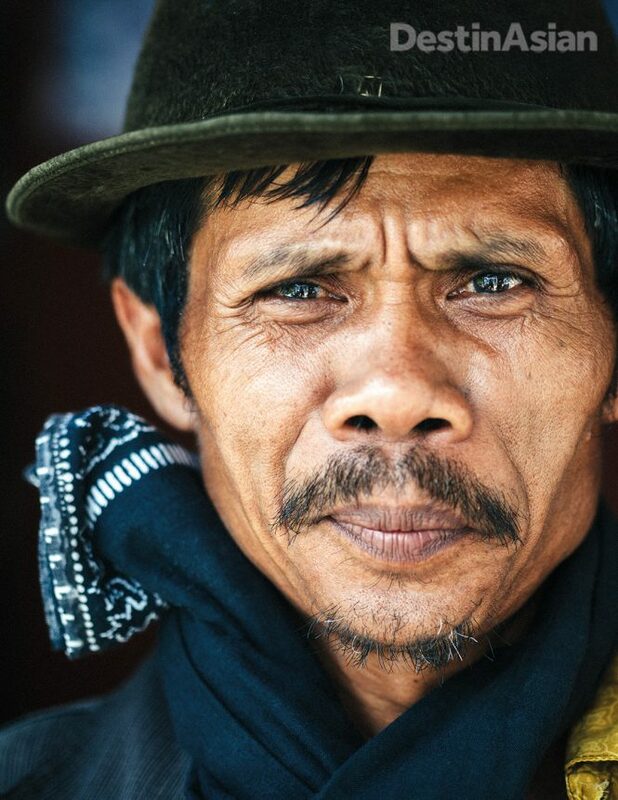 My driver, Erizal (like many Indonesians, he goes by one name), swerves to overtake slow-moving trucks in the harsh midday sun, its rays refracted through a sizable crack running down the windshield’s left side. I eventually see that a chunk of the steering wheel is missing, perhaps eaten away by years of exposure to the salty sea air. It’s a thrilling introduction to the largest island in the Riau Archipelago, and a reminder that we are on the very edge of Indonesia. 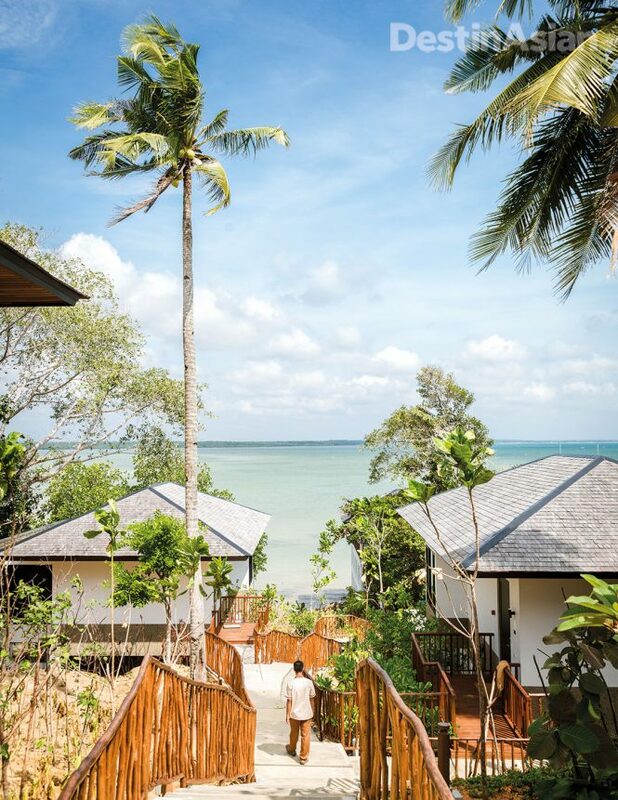 Bintan might be synonymous with Bintan Resorts, a sprawling, master-planned enclave for weekending Singaporeans along the north shore, but that’s just part of the story. 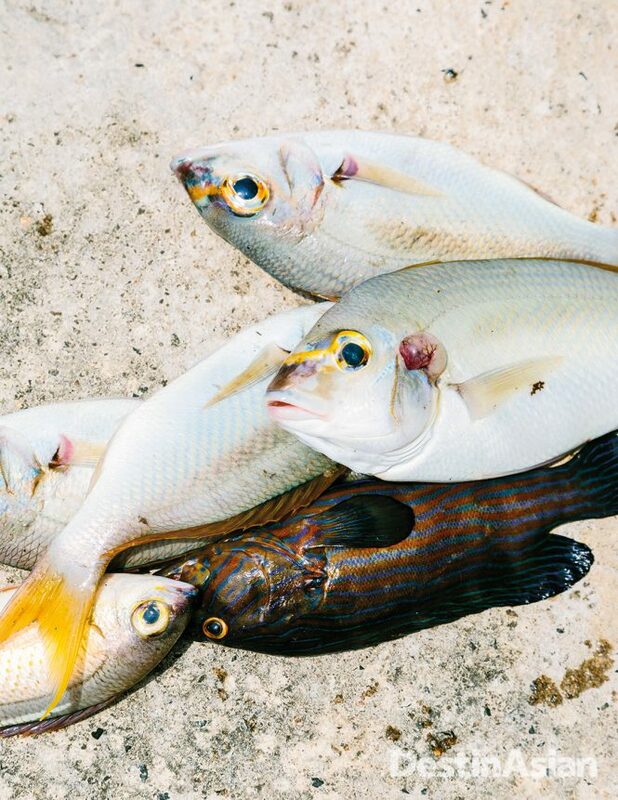 The 2,400-square-kilometer island was once the abode of Malay kings and a hideout for pirates preying on Chinese ships; its understated charm belies a long, colorful history as a cultural crossroads. The overgrown facade of Senggarang’s Banyan Tree Temple. I have come here to catch a glimpse of that past and to see how Bintan is being primed for future development. Erizal tells me its glass-and-steel airport terminal, where I flagged him down, hasn’t been there for long. The road we’re on is also new. But his cab evidently is not, and soon after we pass through the gateway to Bintan Resorts, the taxi light detaches from the roof and hits the ground with an unceremonious thud. I’m not surprised when the security guards at Laguna Bintan greet us with bemusement. Comprising an 18-hole golf course and three hotels (all run by the Banyan Tree group) spread across a 1.1-kilometer-long beach and adjacent headland, Laguna may well be the island’s best-known resort area. 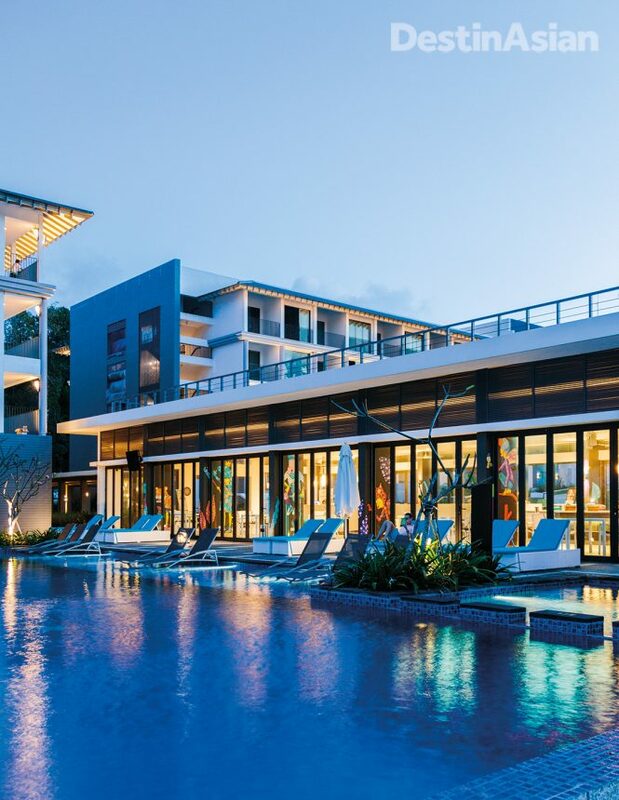 Its newest addition is Cassia Bintan, which opened last August with 180 holiday apartments aimed at families and millennials. Best of all are the lofts: airy, double-height spaces flooded with natural light, boasting a mezzanine level above the living room and open kitchen. Pops of turquoise complement the graphic wallpaper and prints of Komodo dragons, Sumatran rhinoceros, and other Indonesian wildlife. The overall vibe—casual but playfully chic—extends to the communal spaces as well. Street art adorns the lobby, which comes stocked with healthy ready-made meals and fresh ingredients to whip up an in-room pad thai or nasi goreng (steamboats and grills are also available for rent). An enticing infinity pool overlooks the umbrellas and outdoor sofas of Xana Beach Club, shared with sister property Angsana next door. A resident at Panglong Village. A Mangrove Discovery Tour on the Sebung River. Past the turtle hatchery, Purnama points out a private cabana that is the backdrop for Dinner of the Legend, a colonial-style rijsttafel feast enjoyed while a storyteller spins yarns from local folklore. And there’s plenty to work with. If the semi-historical Malay Annals are to be believed, it was while on a hunting trip in Bintan that Sang Nila Utama, a late-13th-century prince of the maritime Srivijaya Empire, first saw neighboring Singapore and resolved to pay it a visit. That led to the sighting of a mysterious “lion”—forever associated with the island’s identity—and the founding of the Kingdom of Singapura. Inside the chapel at the grotto of Santa Maria, where Sunday mass is regularly held. 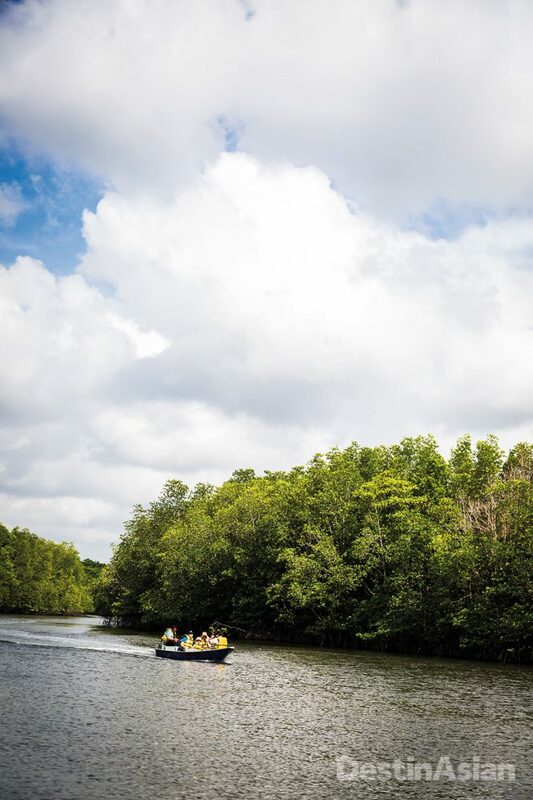 One such experience is the Mangrove Discovery Tour, an hour-long cruise on the meandering Sebung River in a motorized 10-seater boat. We’re in luck: the river is as smooth as glass, and since it’s low tide, the mangrove roots are clearly visible. The cruise also affords an unexpected glimpse into the local history. At one point, an overgrown red-brick charcoal kiln emerges out of the thick foliage like some long-lost stupa. 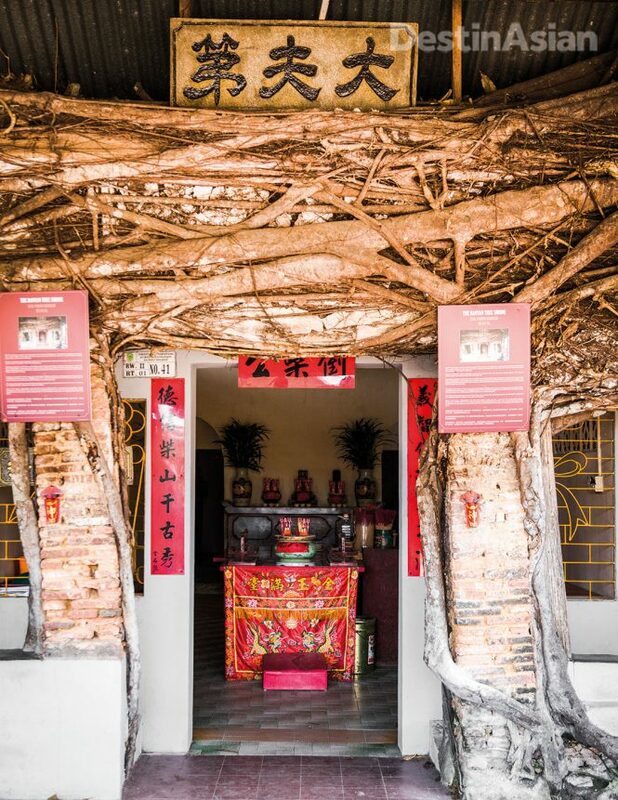 Until the practice was outlawed a couple of decades ago, mangrove trees all across Bintan were cut down and slow-burned for up to two months to create export-grade charcoal. The abandoned kilns still dot the island; Iris is unsure exactly how many there are. Eventually the mangrove branches from opposite banks overlap and intertwine above us like a canopy, filtering the equatorial sunlight into jewel-like patterns and crepuscular rays. “This is my favorite part,” Iris says, lowering her voice almost to a whisper. “It’s like entering another world.” By now, the river has narrowed to the point where its banks are within touching distance, and we can make out the finer details: a camouflaged monitor lizard napping in the sun, tiny mud crabs skittering into their burrows, surreal aerial roots shaped like ribbons, bent knees, and bulbous pencils. On two occasions we spot a venomous mangrove snake, glossy black with neon yellow markings, coiled up asleep in a branch overhead. If all that weren’t thrilling enough, the 338-hectare adventure playground of Treasure Bay lies just up the road. 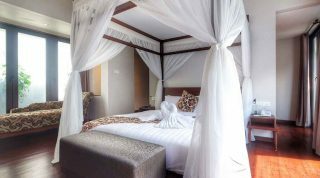 It’s the place for knuckle-clenching ATV rides up and down a thickly forested hill, and tented stays at The Canopi—100 safari-style rooms fronting Southeast Asia’s largest recreational saltwater lagoon, where diversions like kayaking and wakeboarding are possible even during the northeast monsoon. And opening any day now, Treasure Bay’s latest attraction will be a marine life park with pavilions sporting the saddle-like pitched roofs found in vernacular Riau architecture. A private six-kilometer stretch of river sets the stage for a pontoon cruise through the mangroves. Inside a villa at The Residence Bintan. With Maradu at the wheel, we leave Laguna Bintan and make a beeline for the northeast coast. After breezing past dozens of thatch-roofed kelong fishing platforms buoyed up by oil drums, we step out to wander the overwater lanes of Panglong Village, a government-built settlement for the orang laut, sea gypsies who have inhabited these islands since time immemorial. At Teluk Bakau Bay View Restaurant, a rustic open-air seafood joint mere meters from the beach, I bite into the local specialty gong-gong (dog conch) and the biggest and meatiest steamed crab I’ve ever tasted, with claws almost the size of a human hand. 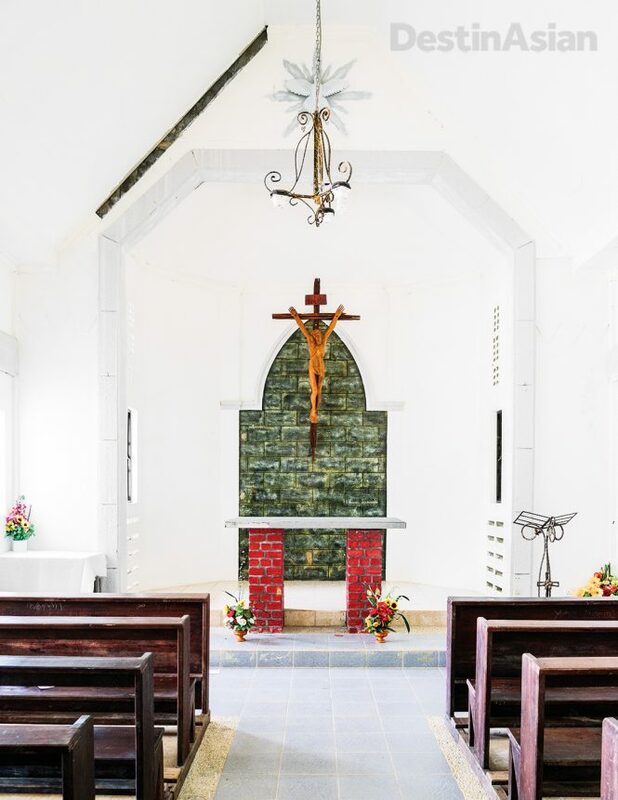 Then, above the near-empty sands of Trikora Beach, Maradu takes me to the Grotto of Santa Maria, a Catholic sanctuary dating to the 18th century that features a little chapel, limestone sculptures of the stations of the cross, and a small cave where a Madonna statue stands atop a globe. Turning southward, we press on in the fading afternoon light to reach The Residence Bintan, the first Southeast Asian property by the Singapore-based Cenizaro brand. The resort is just five days old at the time of my visit, but it isn’t hard to imagine how it will look when the landscaping is complete and the grounds are carpeted in grass and luxuriant beach cabbage. 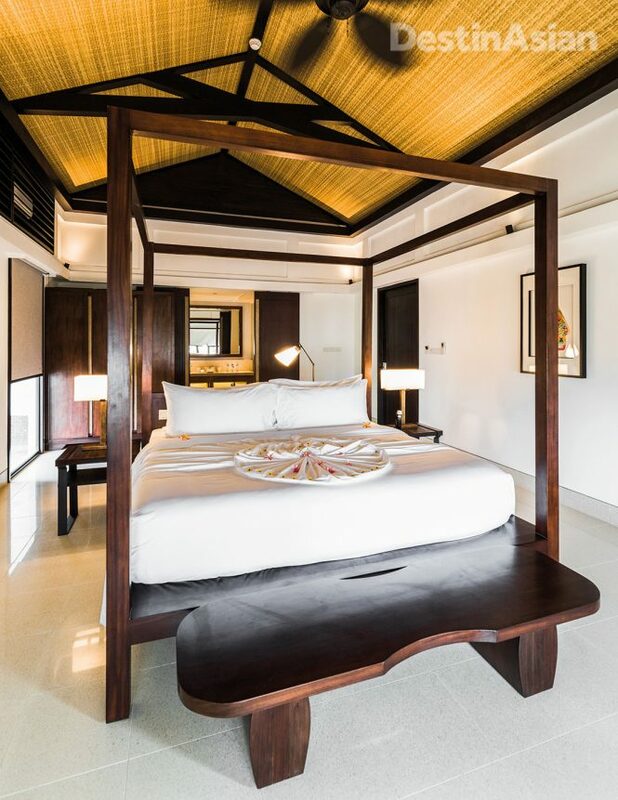 Its 127 rooms and villas sport soothing whitewash and neutral colors, as though in deference to the greenery and South China Sea outside the windows. At the top of the line is a collection of 15 villas called The Estate, whose lodgings have plunge pools tucked deftly between the trees, split-level timber decks, and unthinkably spacious bathrooms with adjustable screens to let in the ocean breeze. 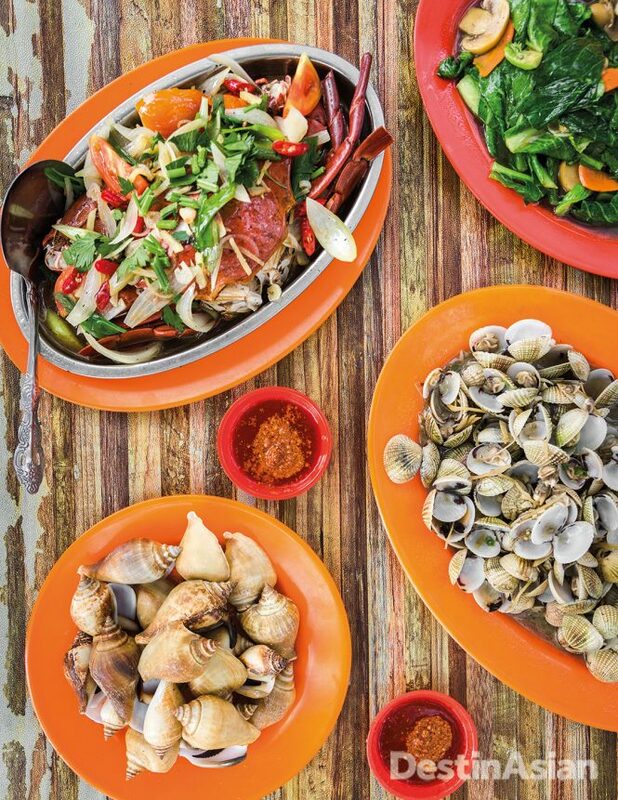 A seafood spread at Teluk Bakau. Since it’s still monsoon season and the seas are rough, I opt for a guided excursion to Tanjung Pinang, a workaday port of 200,000 and the provincial capital of the Riau Archipelago. 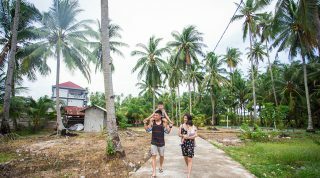 Across its harbor lies the stilted village of Senggarang, said to be the first Chinese settlement on Bintan, but I’m most looking forward to stepping ashore at Penyengat Island, a 15-minute ride away on a rickety pompong boat. Though 60 percent of the local population is descended from Malay royalty, there’s not much to suggest that sleepy Penyengat Island was once the seat of the Riau-Lingga Sultanate. We pile into a boxy motorcycle rickshaw for a whistle-stop tour of the main sights, among them the well-tended graves of Raja Haji Fisabilillah—who died in 1784 in a raid against the Dutch—and his grandson Raja Ali Haji, a prolific author, poet, and historian credited with giving the Malay language its first modern dictionary. 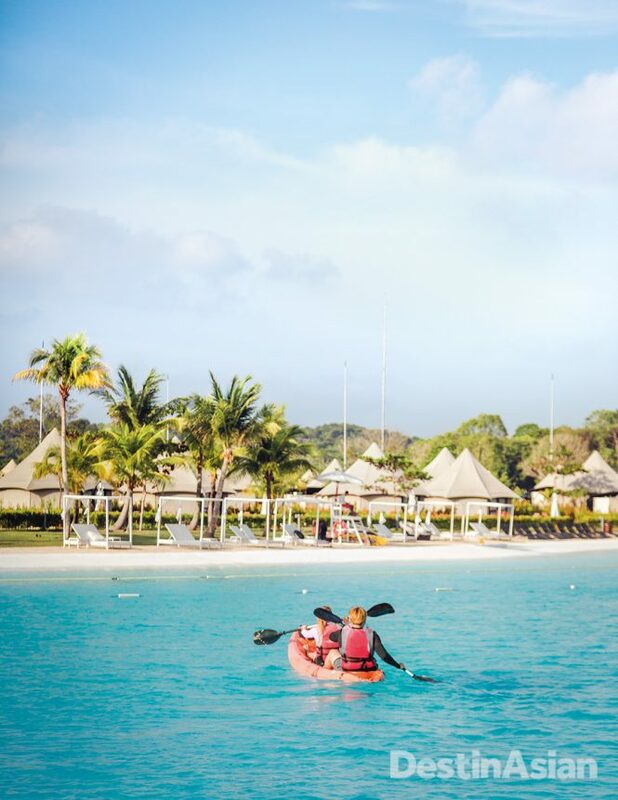 Kayaking on Treasure Bay’s saltwater lagoon. The fact that so little remains of the island’s regal past apart from these tombs is no accident. In February 1911, during the northeast monsoon, hundreds of Dutch colonial troops descended on Penyengat Island to force an end to the sultanate. Defiant in the face of superior firepower, the royal court set their buildings ablaze to stop them from falling into enemy hands. The sole landmark to survive the assault was the early 19th-century Grand Mosque, which rises above the main village in a confection of pastel yellow domes and four pencil-like minarets. The last sultan of Riau, Abdul Rahman II, left for exile in Singapore with his queen, followed by the crown prince and a coterie of loyal followers. Given the stone-inscribed verses by Raja Ali Haji in an airport bearing his grandfather’s name, it’s clear that Bintan still remembers that era. The day’s catch at Panglong Village. Maradu had told me that the phantom ship Lancang Kuning reveals itself to those who long to see it. The same is true of Bintan; it rewards the inquisitive and the keen observer, the stranger who appreciates its existence in the peripheral space between land and sea, between the ebb and flow of time. Late afternoon at the far end of the main beach fronting Laguna Bintan. 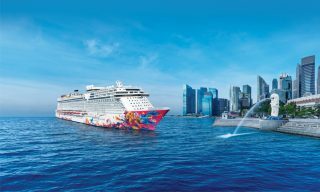 The easiest route is a 55-minute hop from Singapore aboard the high-speed catamarans run by Bintan Resort Ferries to Bandar Bentan Telani Ferry Terminal on Bintan’s northern coast. In the south, the airport at Tanjung Pinang has regular domestic flights from Jakarta aboard carriers like Garuda Indonesia. 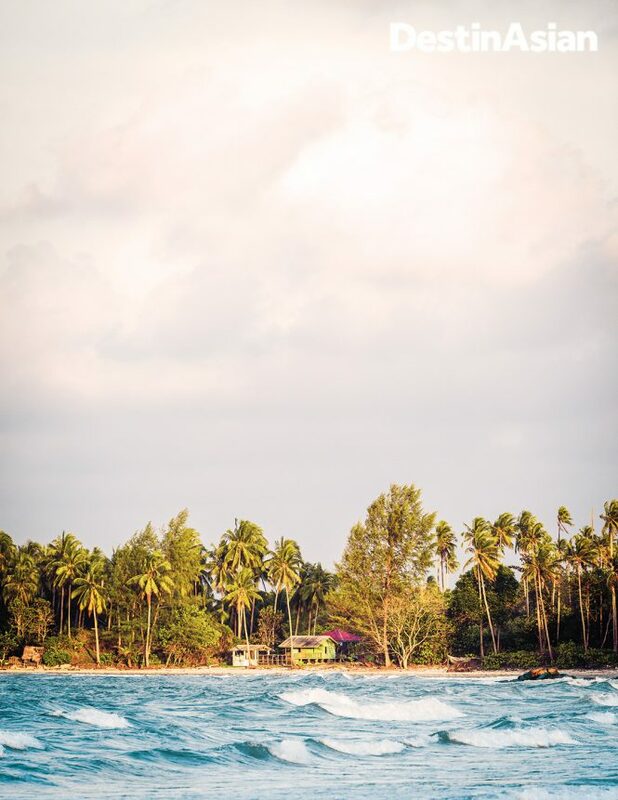 Though Bintan is a year-round destination, rough seas during the northeast monsoon from December through March restricts most ocean activities. 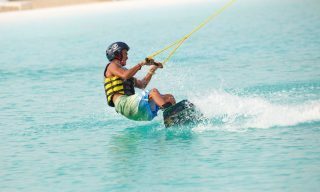 April to November is the best time for swimming, snorkeling, and other water sports. This article originally appeared in the April/May 2018 print issue of DestinAsian magazine (“Peripheral Vision”). 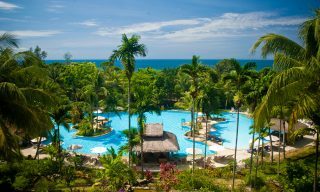 Read about the exciting developments on the Indonesian resort island of Bintan.